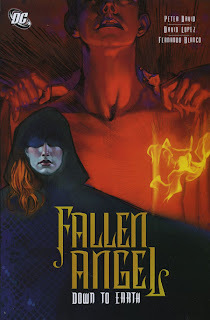 I'm one of those fans, admittedly, who picked up Peter David's Fallen Angel because of David's decidedly brilliant choice to model the Angel after the Supergirl of his recently cancelled series. That tie, however, wasn't ultimately enough to keep the series afloat, nor did it help that the title existed in a somewhat strange midway between the DC Universe proper and DC's mature Vertigo imprints. I wonder how Fallen Angel might fare if it were released now in our post-Infinite Crisis era of more mature titles like Checkmate and Secret Six. The second Fallen Angel trade, Down to Earth, doesn't answer many more questions about who the Angel Lee is (though her former life as Linda Danvers seems less certain all the time), but it does provide more details as to how Lee came to Bette Noire. Through a series of three connected adventures, Lee fights Black Mariah, recovers the holy shard that brought her to Bette Noire, and then bails out Mariah for having lost the shard. These stories, combined with a "one year earlier" tale of when Lee met Doctor Juris, provide us enough background on Lee to essentially recognize just how much we don't know about her. I thought, going in to Fallen Angel, that the mystery of Lee was the mystery of how she ended up in Bette Noire; instead, it turns out that Lee is in Bette Noire by happenstance, and that her powers and the tragedy that compels her are buried far deeper. Don't get me wrong, I enjoyed the complex stories contained here, but in the end the mysteries of the Fallen Angel still remain. One point in this trade finds Lee caught in the unlikely position of a receiving a scathing critique from a nun, followed by advice from the bartender Dolf (who, it's suggested, is not just a Dolf, but Adolf). Dolf suggests, with great irony, that there's no such thing as good and evil, but rather "greater" and "lesser." Lee then saves Mariah, and she's coy with her reasons for doing so. The idea Peter David presents here is one of greater and lesser evils; Lee takes the shard from Mariah because Mariah stole it, but saves Mariah because the villain that threatens Mariah is one worse than Mariah herself. This is all predicated by a chilling issue where Lee tortures Mariah for the location of the shard; to be sure, Lee works here for the greater good, but David gives the reader to understand that "greater" doesn't always mean "pleasant." Having recently finished reading a bunch of Manhunter trades, I can't help but see similarities between Manhunter and Fallen Angel. Manhunter is certainly more of a superhero title than Fallen Angel, but the title characters share an anti-hero ethos that makes me consider again how Fallen Angel might fare as a DC title just a few years later. There's also an undeniably Manhunter-esque camaraderie that begins to grow in Fallen Angel's supporting cast toward the end of Down to Earth. Fallen Angel is populated mostly by villains, but when the Lee saves Black Mariah in Bumper's lair, it seems like something almost akin to friendship blooms between the three. I do regret that DC didn't finish collecting this series, as I'd be interested to see how these relationships continued to grow. Back to the DC Universe proper now for some Nightwing and Robin. We also have Shadowpact on the horizon, and more. Stick around!